Ben Spencer's online marketing company, The Blood Partnership, relies heavily on Westlake, a property developer, for most of its business. Westlake is owned by a Robert Maxwell-like magnate, Jack Westlake, assisted by his two sons, Alex, Ben's close friend, and unfriendly Mike. Jack's daughter, Caitlin, is a city high-flier who hero-worships her father - and is Ben's fiancee. At the start of the book, Ben and Alex are in a pub discussing the environmentalists who are campaigning against the housing developments being built by Westlake. One of these is Ben's awkward father, Tom. Alex reveals to Ben how he feels trapped in a job he doesn't respect. They leave the pub to pay a late-night visit to the building site, where they are viciously attacked: Alex is killed and Ben barely pulls through. Six months on, Ben's comfortable if slightly uneasy life spirals into ever-increasing chaos and nightmare. Jack hires an old college friend of Caitlin's, the nasty Boris, to replace Alex at Westlake. Boris decides to work from Ben's offices to oversee all his company's work for Westlake, and bullies Ben and his staff mercilessly. He's also suspiciously close to Caitlin, who becomes increasingly distant and aggressive to Ben over the unsolved murder of her brother Alex. The police are suspicious both of Ben and Tom in this regard, even though Ben was badly injured. Tom is making life more and more difficult for Westlake and its plans to build yet another housing estate, this time in Tom's own village. Jack and Boris try to bribe Tom to drop his opposition, then when this approach fails, threaten to sue him for assaulting a surveyor. Ben's relationship with Tom is to say the least difficult, and he is at a loss when Jack and Boris try to force Ben to make Tom cave in under threat of withdrawing their business from Ben's company. No sooner has an old girlfriend of Ben's turned up out of the blue with some shocking news, than she is involved in a car accident and is in hospital near Tom's home. Ben spends all his time dashing between Caitlin, the Westlakes, his ex-girlfriend, his father, torn in all directions, when one night a car tries to run him down. Was his father involved? Could the Westlakes have decided to get rid of him for good? 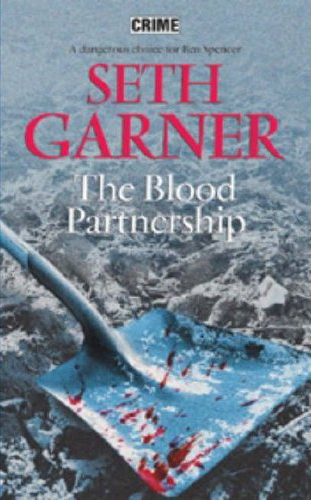 THE BLOOD PARTNERSHIP is a fast, exciting read. However, by the final part it does begin to come apart at the seams a bit. The car that tried to run Ben down smashes into shops and buildings and ends up on fire in a field, but is later recognised by Ben as being driven by a kidnapper. Two people are revealed to have been " in cahoots", but their partnership relied on one of them not telling the other one a vital piece of information that I think must have been impossible to conceal. There are other examples of illogicality. The final scenes in the attic of Westlake's mansion, when all is revealed, are melodramatic and unrealistic: quite a contrast from the rather clever and nimble plotting of the first three-quarters of the story. Nevertheless, despite some gaping holes, I enjoyed this book. Ben is an attractive hero, partly because he is a bit weak and dastardly himself. It is a relief that he is on the road to redemption and maybe a happy outcome by the end of the book. His story is "a rattling good yarn": a good, escapist read, which can be best enjoyed if you are prepared not to hold it up to detailed scrutiny. Maxine hangs out at Petrona.